The 1976 United States Grand Prix West, officially known as the 1st United States Grand Prix West or the II Grand Prix of Long Beach, was the third round of the 1976 FIA Formula One World Championship, held on the Long Beach Street Circuit on March 28, 1976. The race, which would mean that the United States became the first country since Italy in 1957 to host two Championship Grand Prix in a single season, would see Ferrari claim a crushing victory over their rivals. Qualifying had seen the Long Beach circuit quickly gain a reputation for being incredibly bumpy, with numerous crashed put down to the rough surface in spite of attempts to smooth the circuit before the meeting. The result would be a rare pole position for Clay Regazzoni in the #2 Ferrari ahead of Patrick Depailler, while Championship leader Niki Lauda found himself in fourth, sharing the second row with James Hunt. With the grid limited to twenty starters there were to be several disappointed drivers when the race got underway on Sunday, with Regazzoni calmly pulling into an early lead. Behind were Depailler, Hunt and Lauda, while Carlos Reutemann and Vittorio Brambilla collided at the first corner. The rest of the opening lap would prove as brutal as qualifying, with Reutemann and Brambilla out on the spot, while Gunnar Nilsson suffered a suspension failure and slammed into the barriers. Fortunately, the incidents were cleared by the time Regazzoni completed the opening tour, with a clear gap back to Depailler and Hunt in third. Lauda looked on in fourth ahead of Tom Pryce and Ronnie Peterson. More damage would come at the end of the fourth lap, as Hunt tried a move on Depailler, only to be greeted with a side-swipe from the Tyrrell as the Frenchman swept into the hairpin. Depailler rejoined with some damage to his car, while Hunt was left with terminal damage, meaning he had walk back to the pits in disgust. Lauda flashed through the scene to make it a Ferrari one-two out front, with the pair duly pulling clear from Depailler as the Frenchman battled with his wounded car. The #4 Tyrrell then went for a spin of its own making and dropped out of the top six, promoting Jody Scheckter, Pryce, Peterson and Jean-Pierre Jarier. Quick-fire retirements for Pryce and Scheckter saw Depailler move up the order, before Peterson dropped down the order with brake problems. Jarier was soon elbowed out of the way by Depailler to put him back onto the podium, while another Frenchman in the form of Jacques Laffite would copy his move towards the end of the race. Out front, meanwhile, Regazzoni was left to claim a dominant victory for Ferrari, a performance that even left teammate and Champion Lauda over forty seconds behind. Depailler fell shy of the Austrian by eight seconds to finish third, while Laffite claimed his first points of the season in the little Ligier-Matra. Jarier faded badly in the closing stages and tumbled out of the points, meaning Jochen Mass and Emerson Fittipaldi completed the scorers. The Long Beach Street Circuit had first been proposed as a host for Formula One in 1973, following a desire by the City Council to gain some recognition by staging a Grand Prix on the Pacific side of the States. Previous attempts to race on the west coast had failed spectacularly, the 1960 United States Grand Prix held at the Riverside International Raceway disappearing instantly from a lack of spectators, while the non-Championship Questor Grand Prix vanished with a lack of sponsorship. Yet, English entrepreneur Chris Pook managed to arrange for the "Long Beach Grand Prix Corporation" to section off the area around Ocean Boulevard for a World Championship race, and created a prize pool north of $265,000. The circuit itself had been tested once before, a 'warm up' Formula 5000 race staged in September 1975 that had featured some of the current F1 field, and won by ex-F1 racer Brian Redman. Layout wise the Long Beach Street Circuit fell in between the now infamous and fast Montjuïc Park Circuit, and the famously slow Circuit de Monaco. The two streets main Ocean Boulevard and Shoreline Drive were joined by a mix of tight chicanes, 90° corners and two hairpins, all paved in some very bumpy tarmac. Indeed, the bumpiness proved to be such a major issue in the F5000 race, that the LBGPC paid a fair amount of money to smooth out the bumps ahead of their F1 debut. With Pook's huge prize pool there was little surprise that the entire "class of 1976" would make their way to Long Beach, in spite of the muted concerns regarding the narrow layout and suspension smashing bumps. Leading the charge would be the two American based teams, Penske and Parnelli, the latter having fielded a team in the F5000 race. Indeed, Parnelli's main driver Mario Andretti had been the star attraction in that race, and therefore knew his way around, although John Watson and Penske were determined to beat their main rivals. Others with Long Beach experience were to be found in the form of Tom Pryce, who had raced privately at the 1975 race, and would partner Jean-Pierre Jarier as usual at ex-US team Shadow. Chris Amon had also featured in the F5000 race, and duly appeared for Ensign, as would Brett Lunger for Surtees. Indeed, it had been a good few weeks for John Surtees' effort since the race in South Africa, as the ex-World Champion signed promising Australian talent Alan Jones to the team. The Australian prospect had earned his seat with an excellent display in a rented Surtees at the 1976 Race of Champions, finishing second overall in a new TS19. The winner of the Race of Champions was to be found in the form of James Hunt, who would appear in Long Beach with teammate Jochen Mass and a full blooded McLaren effort. Rivals Tyrrell, whom had made a huge fuss in Kyalami over McLaren's use of "skirts" were also in attendance, and had the advantage of prior knowledge. Jody Scheckter had been among the F1 contingent to try out the circuit in the F5000 race, and would impart his knowledge to teammate Patrick Depailler throughout the weekend. Championship leaders Ferrari, meanwhile, arrived with their increasingly daunting duo of Niki Lauda and Clay Regazzoni, armed with three cars for the weekend. Lotus, meanwhile, arrived knowing that this would be little more than an extended test session for them, with inexperienced pairing of Gunnar Nilsson and Bob Evans armed with the new Lotus 77 for only the third time. Brabham also expected a difficult weekend, with the Alfa Romeo engines in the back of Carlos Reutemann and Carlos Pace's cars proving particularly unreliable without the addition of a bumpy circuit. Elsewhere, the Wolf-Williams effort arrived with a two car entry for Jacky Ickx and Michel Leclère, and were determined to make it into the race amid news that the grid was to be limited to twenty starters. They looked set to fight with one of the Fittipaldis, who had added F1 rookie Ingo Hoffmann to partner Emerson Fittipaldi, and the sole Hesketh of Harald Ertl. Ligier-Matra were, in contrast, and unknown, with Jacques Laffite sent into the US with a number of Matra V12 engines to counter any bump related failures. Completing the entry would be a full quartet of Marchs, all of which would be run by the factory team, but all decked out in unique liveries. The striking orange of Vittorio Brambilla would lead the effort alongside the blue/yellow entry for Ronnie Peterson, listed as #9 and #10 as usual. Regular runner Hans-Joachim Stuck was also in Long Beach with the #34 761, while the newest car had been handed to Arturo Merzario, who brought a title sponsor along with him. It was very much a decision of quantity over quality for March, who were determined to claim a huge slice of the $265,000 prize fund. A second straight victory out in Kyalami saw Lauda claim an already daunting twelve point lead after the opening two races of the season, leaving Depailler and Hunt level on points in second. The Brit's form suggested that he was the only likely challenger to the flying Austrian, although Lauda's advantage in the standings suggested that it would be difficult for anyone to challenge. 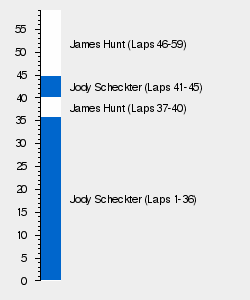 Mass and Scheckter completed the top five. Thanks to Lauda's victories, Ferrari already had a whole race advantage over second placed Tyrrell-Ford Cosworth, the Italian firm having left South Africa with a nine point lead. The Surrey based squad themselves held a two point advantage over McLaren-Ford Cosworth, with a small gap back to Shadow-Ford Cosworth in fourth. Other early scorers included March-Ford Cosworth, Penske-Ford Cosworth and Parnelli-Ford Cosworth. Practice/qualifying would once again be staged across four sessions and two days, with both Friday and Saturday in Long Beach designated practice days. The third session of the weekend, the morning run on Saturday, was to go untimed to allow teams to focus on high-fuel runs, meaning it would be the final session where drivers were likely to set their best laps. As for a target time the only reference F1 had going into the race would be Mario Andretti's pole time from the F5000 race in 1975, a 1:21.297. Given the complaints of bumpiness during the F5000 race in September 1975, the first session of qualifying would not be the failure fest that many engineers had predicted. Indeed, the only driver to suffer a catastrophic issue would be Jacky Ickx in the Wolf-Williams, as the Belgian hit gearbox trouble on his first timed lap. The #20 Wolf-Williams therefore spent the entire day in the pits having its gearbox changed, joined in the pits at the end of the session by the Lotus of Bob Evans who suffered an engine failure. Time-wise there was little surprise that Niki Lauda topped the timesheets after the first session, two tenths clear of Ferrari teammate Clay Regazzoni, with James Hunt sat in between. Andretti was another to impress, fourth fastest come the break having had the advantage of running in the F5000 race with his current team, albeit in a different car. Also seeming strong was the Penske car of John Watson, fifth fastest on Friday morning, while Patrick Depailler completed the early top six for Tyrrell. Friday afternoon proved to be more brutal as drivers searched for pace, Evans' Lotus teammate Gunnar Nilsson picking up significant damage to his 77 after being bounced into the barriers. Others would pick up minor suspension problems from the bumps, requiring some attention in the pits after the session, while Lauda suffered an engine failure in the spare Ferrari. In between the sessions, the "muletta" had also been tried out by ex-Ferrari Champion Phil Hill, who borrowed Dan Gurney's helmet to have a go. Time wise, Lauda would not end the day on provisional pole, for Depailler had pushed hard in the #4 Tyrrell to record a 1:23.884, a few hundredths ahead of Hunt in second. Regazzoni was another to finish ahead of the Austrian World Champion, as did Andretti in the Parnelli. Elsewhere, Evans and Ickx failed to record a time, Watson produced a late effort to break into the 1:24.000s, and Harald Ertl would end the day as the slowest driver with a 1:28.954. After the non-qualifying third session, which saw Ickx's miserable luck continue with a driveshaft failure, the fourth session would be all about the fight for pole. Times tumbled throughout the afternoon, although it was Lauda who struck first with a 1:23.647, only to suffer a driveshaft failure on his next flying lap. That opened the door for Hunt to go fastest, only for the Brit to be denied a front row start by an excellent lap from Regazzoni, a 1:23.099 to claim pole, and a charging Depailler. Elsewhere there would be an equally tight fight to qualify, as seven drivers would miss the mark as the organisers limited the grid to twenty starters. The final result was undecided until the final moments of the session, with Michel Leclère just falling shy of Nilsson's effort on his final lap. Also out were Ingo Hoffmann, Arturo Merzario, Evans, Ickx, who had had to learn the circuit in less than an hour, Ertl and American racer Brett Lunger. It was a remarkably close session all told, with 3.729 seconds covering the field, and just two tenths separating the qualifiers from the failures. Bold indicates a driver's best/qualifying time. Leclère was allowed to join the back of the grid at the start as "first reserve". Raceday proved to be another warm and dry affair in Long Beach, with no sign of rain to disrupt proceedings ahead of or during the race. Warm-up would pass without issue, meaning all twenty qualifiers, plus first reserve Michel Leclère, would line up on the grid for the start. Leclère would get the chance to start the race if someone failed to leave the grid when the lights went out, otherwise he was to be wheeled back into the Wolf-Williams pit box. Unfortunately for the Frenchman he would not be allowed to join the race, as all twenty qualifiers shot away from the grid, all trailing pole sitter Clay Regazzoni. Indeed, the Swiss racer would sprint clear out front, dragging James Hunt past Patrick Depailler for good measure, although the Brit was left to fight for second rather than challenge. Otherwise the start was relatively clean, until Carlos Reutemann and Vittorio Brambilla bounced off each other at the first corner, leaving both with terminal damage. The rest of the opening tour was less frantic, although Gunnar Nilsson would only make it to the end of Shoreline Drive before a suspension failure pitched his Lotus into the wall. Elsewhere, Hunt made a poor exit out of the first hairpin, and was duly overtaken by Depailler, with Lauda unable to slip by the Brit before the McLaren go up to speed. Those three would continue in their revised order until the end of the lap, with Regazzoni already a second and a half clear ahead. The opening stages of the race, unaffected by littered pieces of Brabham, March or Lotus in certain sections of the circuit, were all about the fight for second, with Depailler fending off several challenges by Hunt. They would, somewhat inevitably, come to blows in the middle of the fourth lap, with Hunt lining up a dive on the brakes into the turn five hairpin, only for Depailler to move across the front of his McLaren. Hunt opted to try a move around the outside instead although, having managed to pull alongside the Tyrrell, soon found himself running out of room. As Depailler later claimed to have "snatching brakes", the #4 Tyrrell effectively elbowed the #11 McLaren into the outside wall, with Hunt left with damage to the left hand side of his car. The furious Brit would jump out of his car and make a slow walk to the pits, waiting for Depailler to reappear on the following lap to step out onto the circuit and wave his fist at him. Hunt's slow walk was made all the more acrimonious after the race, as the McLaren engineers that retrieved the car were able to drive the damaged car back to the pits. Regardless, Depailler would continue on in a podium spot, albeit down to third as Lauda had used the move to jump into second. The Austrian racer duly managed to sprint clear, although by the time he had moved into second, he found that teammate Regazzoni was already seven seconds clear. Indeed, the following laps would see Lauda push as hard as he could to try and catch his Swiss teammate, only for the #2 Ferrari to creep further and further up the road. Elsewhere, Jody Scheckter was making progress after his poor qualifying result, scrapping with Tom Pryce in the first of the Shadows as they trailed Depailler. Ronnie Peterson was also running well for March, sitting just behind Scheckter and being shadowed by the second Shadow of Jean-Pierre Jarier. Carlos Pace was next up, fending off challenges from Mario Andretti and Carlos Pace, while John Watson's promising grid position was completely undermined as he ran around at the back of the field with several issues on his Penske. With Lauda now out of sight, the fight for third became the centre of attention, with Scheckter, Pryce, Peterson and Jarier all jostling behind Depailler. Whether the Frenchman was carrying damage was unclear, although his teammate Scheckter certainly was battling issues, having felt an itch in the opening stages. This itch, located on the South African's backside, soon developed into a searing pain in his lowerback, quickly followed by a strong smell of petrol within the cockpit. Indeed, the #3 Tyrrell was leaking its high octane fuel into the bottom of the cockpit, although Scheckter decided to carry on as long as he could. Such was the South African racer's determination that he managed to get ahead of teammate Depailler, a move that also opened the door for the Shadows and Peterson. The quintet continued to race around together until mechanical fatigue set in, with Depailler slowly picking off Jarier and Peterson. Elsewhere, Andretti finally got ahead of Pace, while the Ligier-Matra of Jacques Laffite was slowly creeping up the order, cracking the top ten on lap seventeen. Shortly before half distance the race was all but over for the lead, with Regazzoni over a quarter of a minute clear and Lauda visibly giving up the fight. The fight for third was also beginning to break apart, Pryce falling out of contention with a driveshaft failure, allowing Scheckter and Depailler to break away. Peterson and Jarier remained a threat but seemed unable to challenge, while Laffite and Mass continued to climb up the order, both catching the fading fight for third. More dramas in the pack would see Peterson drop out of contention with a leak on his master cylinder just after half-distance, the Swede having to stop for a top up. Scheckter had already made a dramatic exit from the race, a front suspension failure under braking for turn one sending the Tyrrell into the barriers on lap 35. That suddenly left Depailler on his own in third, as Jarier began to struggle with gearbox troubles in the sole surviving Shadow. Jarier would ultimately fall behind Laffite and Mass in subsequent laps, before losing the use of second, third and fourth gears as the race slowly drew to its conclusion. Emerson Fittipaldi, meanwhile, had quietly gone about things to find himself on the verge of points, as had Chris Amon in the Ensign. Pace was now in free fall with his Brabham burning through its brakes at an alarming rate, while Watson and Alan Jones were frequent pit visitors with a variety of issues. With that the race was effectively over, with Regazzoni pulling more and more time out of Lauda in the closing stages to claim a surprisingly dominant win. Lauda cruised home a clear second to complete a Ferrari 2-1, while Depailler arrived at the flag in third, shortly before a severe ear bending by the retired Hunt. Laffite claimed his best ever finish in fourth ahead of Mass, while Fittipaldi surged past Jarier two laps from home to claim the Fittipaldi team's first ever point. Amon cruised home in eighth in the Ensign ahead of Pace, with Peterson the last man to be classified having had to conserve his brakes for over half the race. * Jones and Watson could not be classified as they had failed to complete 90% of the race distance. First United States Grand Prix West to be staged. Also the first "Long Beach Grand Prix" to be held to Formula One regulations. Clay Regazzoni earned his fifth and final pole position. Ferrari claimed their 80th pole as a constructor and engine supplier. Fourth career win for Regazzoni. It was also the Swiss racer's only Grand Chelem in F1. Additionally, Regazzoni earned his twentieth podium finish. Ferrari earned their 61st victory as a constructor and engine supplier. Despite being beaten to victory for the first time in 1976, Niki Lauda continued to hold his dominant lead in the Championship standings, actually growing his advantage over second to fourteen points. Patrick Depailler remained in second, while race winner Clay Regazzoni leapt up the order having failed to score in the opening two rounds. Jochen Mass and James Hunt completed the top five, while Mario Andretti rounded out the twelve drivers on the scorers list. Ferrari left Long Beach with an equally impressive lead atop the International Cup for Manufacturers' standings, the Italian firm fourteen points clear of Tyrrell-Ford Cosworth after only three rounds. The Surrey squad, in spite of their constant use of the FIA's technical rulebook to throw at their competitors, retained second ahead of McLaren-Ford Cosworth, while Shadow-Ford Cosworth lost ground in fourth. Elsewhere Ligier-Matra had their first points on the board, as did Emerson Fittipaldi at Fittipaldi-Ford Cosworth.